EPHRAIM—Nearly 50 years ago, Richard Nibley was pleading for funds and volunteer hours to salvage the Ephraim Co-op, then known as Snow College Hall. Whether or not the careful restoration of the Co-op is to credited for a flourishing Ephraim in following years, it is safe to say that the Ephraim of today would be barely recognizable to Nibley, who died just a decade after beginning his campaign to save the Co-op. The same week that Nibley wrote his column in the Enterprise, the Ephraim City Council was discussing the dangers of riding horses on Main Street. Now Main Street is home to a Walmart Supercenter, ten-pump Maverik gas station and national franchises like Auto Zone, Tractor Supply and McDonald’s. Construction projects abound and the city recently completed a beautification initiative in the historic downtown. If Nibley in 1969 was trying to reverse a trend of population decline, civic leaders in Ephraim today are working to prepare for the possibility of a population explosion. Is Ephraim on the cusp of something really big? “There’s a lot of growing pains that come with doubling your population,” Bryan Kimball, community development director for Ephraim City, said. Ephraim has twice as many residents today (6,900) as it did in 1990 (3,400). Kimball said projections indicate Ephraim could be poised for even more rapid growth, potentially reaching 18,000 residents by 2032. Around 3,400 students enrolled in classes at the Ephraim campus of Snow College last fall, Beckie Hermansen, the director of institutional research and effectiveness for the college, said. Hermansen said the college expects to enroll 4,800 students by 2030, an increase of 43 percent over the course of 15 years. Dettinger said the college has no immediate plans to become a four-year institution, though four-year degrees are already being offered in some programs like nursing and commercial music. If four-year status were to become reality, growth at the college could accelerate. Both Kimball and Dettinger said the city and the college are working together to prepare for the coming growth. In geographic theory, a primate city is a city that dominates a region in terms of population, economic prowess, cultural output and political significance. 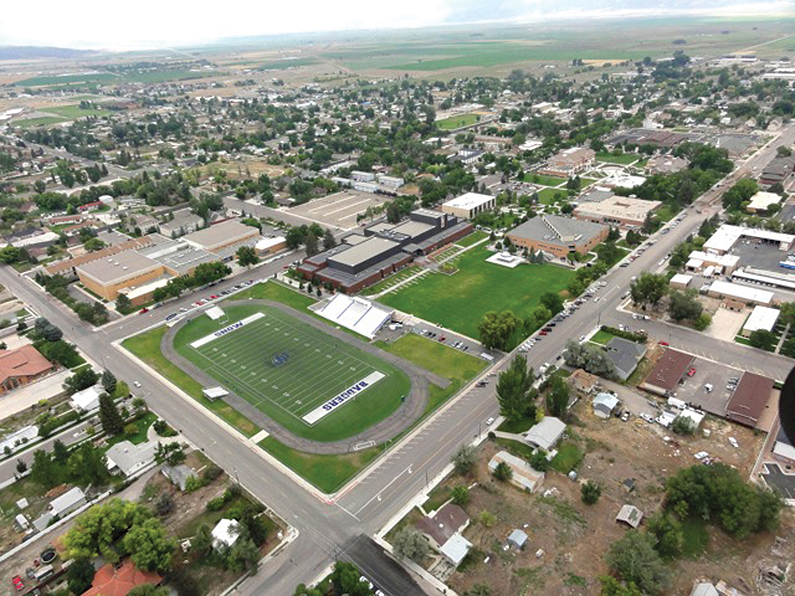 Ephraim appears to pass the first two tests; it is twice as large as the county’s second most populous city, Manti, and it is growing more than four times as fast. Though the combined populations of Manti, Mt. Pleasant and Gunnison exceed Ephraim by roughly 3,000 people, Ephraim in 2015 had $20 million more in gross taxable sales than those three cities combined. The next two tests are more unclear. While Snow College is a significant generator of cultural and intellectual capital, the LDS temple in Manti has long been the center of religious life in Sanpete County. And while some state and federal offices locate in Ephraim, Manti is the county seat and hosts the most significant collection of government agencies within the county. Primate city or not, Ephraim since the 1960s has morphed into a center of regional influence, leaving its sister cities to the north and south behind in some respects. Growth in the retail sector has been especially pronounced since 2000, when Walmart opened on the north end of town. Almost immediately, Ephraim saw sales tax revenues multiply even as tax revenues stagnated in Gunnison and Mt. Pleasant and actually declined in Manti. “People are driving into Ephraim to buy stuff when they don’t live there,” Eric Cropper of the Utah State Tax Commission’s economical and statistical unit said. Walmart touts community donations and creation of jobs as benefits of doing business, but not everyone is on board with the mega-retailer. Kallene Braithwaite, who with her husband, Jim, owned and operated Elliot’s Pharmacy in Manti for more than 20 years, said big box retailers like Walmart create an unfair climate for small businesses, particularly in rural areas. Panle Jia, in another study, estimated that Walmart’s expansion throughout the United States was responsible for half to three quarters of the decline in the number of small retailers between 1988 and 1997. Braithwaite said her attachment to small businesses remained long after she and her husband sold their pharmacy. John Jensen, another Manti business owner, said consumers often don’t consider the implications of choosing where to spend their money. If a resident of Manti, for example, buys goods online or at Walmart that he could have bought in town, he is forfeiting sales tax revenues that could have been used to improve his community. Those considerations aside, Walmart doesn’t appear to be losing any customers. Data for the Ephraim store were not immediately available, but the global company posted positive comp sales for the eighth consecutive quarter in August. Ephraim’s expanding retail core—the opening of Malena’s is the latest in a string of new or improved businesses in town—is likely to draw residents from throughout the region for years to come. And a growing population commensurate with an expanding Snow College means that Ephraim may soon be three or four times larger than any other community in the county. Whatever happens, Kimball said he and his staff are ready.